Hydro-Sponge - Aquarium Technology, Inc.
Hydro-Sponge filters stand tall over the competition with superior construction, quality materials, modular design, (for easy expansion), and affordable pricing. 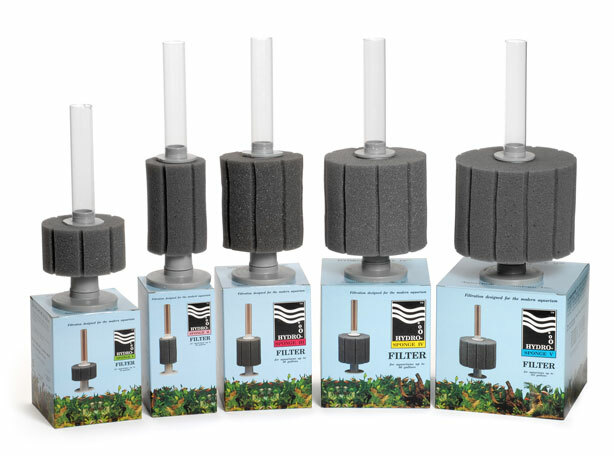 While other sponge filters require suction cups that quickly fail or flimsy bases that allow the unit to fall over, the Hydro-Sponge filters are free standing with a heavy base that locks securely in place, but is easy to unlock if needed and is raised to allow sufficient space so that there are no dead areas between the aquarium floor and the filter. Our quality design brings the sponge filter to a whole new level as a serious filtration system that out competes under gravel biological filters and goes toe to toe with any other filtration system. Breeder tanks, shrimp and invertebrates, tanks on the go, the need for quick bio-cycling, are all obvious applications for sponge filters, but many hobbyists are finding that the Hydro-Sponge is an excellent filtration alternative for any aquarium set up.